North American battery collections increased to a record 10 million pounds (4.7 million kilograms) in 2012, up 16 percent from 2011 levels, according to Call2Recycle, a product stewardship organization managing the only no-cost collection program for batteries and mobile / cell phones in North America. Call2Recycle attributes its success to especially strong collections in California and Canada, which collected over one million pounds each. California became the first state in the program’s history to achieve this milestone. The 11 percent statewide growth for California came from the municipal and manufacturing sectors, which increased by 23 percent and 24 percent, respectively. Battery collections grew by 56 percent in Canada for 2012. The increase can be accredited in part to its program expansion in Quebec, where Call2Recycle was selected by RECYC-QUÉBEC to serve as the official battery recycling program for the province. As of July 2012, Call2Recycle began accepting single-use household batteries for recycling in support of the provincial extended producer responsibility (EPR) regulation. As a result, 2012 collections in Quebec rose by 357 percent over 2011. 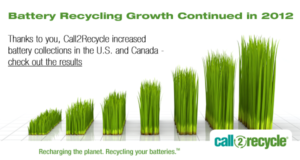 Call2Recycle offers convenient battery collection sites through a network of over 30,000 retailers, municipalities, businesses and public agencies throughout the US and Canada and is a Corporate Member of the Global Product Stewardship Council. The GlobalPSC appreciates the long-term support of Call2Recycle and congratulates them on their continued success.